When reviewing the Flexio 590 by Wagner, it is important to consider the paint areas you will be spraying. This spray gun is lightweight and suitable for small jobs. It is not recommended when larger areas need to be covered. What is This Wagner Spray Gun Good for Painting? This complete sprayer kit allows you the power to tackle most small painting projects. It claims to be 50% more powerful and 20% lighter than other handheld airless paint sprayer models. 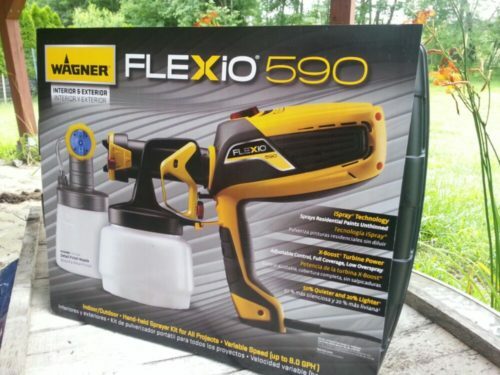 Like the Wagner Flexio 890, you’ll receive two spray nozzles with your Wagner Flexio 590 paint sprayer. The Lock-N-Go split gun design allows for quick nozzle change and easy clean up when the painting is over. It also features a nice price, affordable to anyone needing to do some home repairs. This Flexio Sprayer offers a slightly stippled, roller-like finish. You can spray faster and with better coverage than when you use a brush or roller. The detail finish nozzle makes the smaller aspects of the job a breeze as well. You can use this to spray anywhere, indoors or out. Just keep in mind that the shorter power cord will require the use of an extension cord. To offer additional peace of mind, the Wagner Flexio 590 paint sprayer also comes standard with a 1-year warranty against any defects. With the stippled, roller-like finish, you’ll find this paint sprayer to be ideal for interior walls and not outdoor projects. You can also paint edges, corners and broad interior surfaces faster and with better coverage. The Wagner Flexio 590 can easily spray unthinned interior or exterior latex paints, sealers, stains, oil-based materials and urethanes without a problem. You can choose to use it on the small exterior surfaces of a house, or fine finishing projects. The two separate nozzles and cups allow for maximum project flexibility. The iSpray nozzle adjustments allow for different patterns and width of the arc. You can fine-tune the cap and tackle a big wall or large project easily. Just be sure you have it set to a higher power and wider pattern. When doing a smaller project, use a narrower pattern. The Detail Finish Nozzle is perfect for your detail work and smaller projects. Use this on paintings, trim, lattice, small furniture and more. This isn’t designed to hold thick materials and it will only support oil-based paints or stains, so keep that in mind. Because of the ease of using and setting up this unit, anyone can use it. Professionals will appreciate the adjustable controls and beginners will be amazed at how much time is saved. The setup of the Wagner Flexio 590 couldn’t get easier. Start by masking anything that shouldn’t be painted. Then, you can unscrew and fill the cup of your unit. The Lock-n-Go feature is going to allow you to quickly attach the nozzle to the Turbine assembly. You will use the same procedure whether you are using the iSpray or detail nozzle. Set your controls for the project you are working on. Then, be sure you take some time to practice with the gun before you begin your project. If you are unsure of what to do, be sure you refer to the Power and Materials Guide in your Owner’s Manual. Always be sure that your suction tube is firmly in place. Aim the tube towards the front of the cup when painting downwards or towards the back of the cup when painting upwards. This airless sprayer features an X-Boost power dial that provides maximum adjustability for precise control. 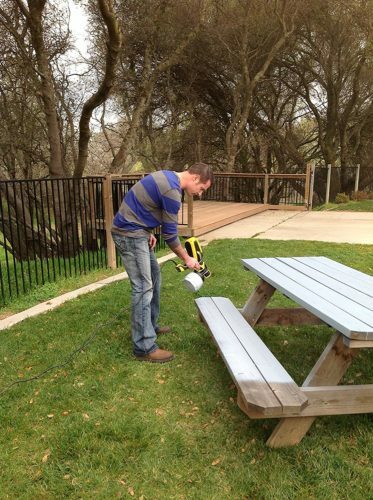 his allows you to complete your jobs three times faster than a conventional paint sprayer. It also sprays up to 8 gallons of material per hour and the included cup can cover 125-square feet on just one fill. Everything you need to do is available on the integrated spray controls. Start by setting your X-Boost power dial based on the materials you are spraying. There are 9 power settings available with your lowest numbers being geared toward thinner materials and the larger numbers for the thicker materials. You would use the 9 for materials such as paint and primer in one product. Turn your material flow control dial clockwise when you are working with thicker material to offer maximum flow. Then, turn it counter-clockwise to reduce the flow when working with the thinner materials. The adjustment ring on your Flexio 590 iSpray nozzle determines the width and shape of the spray pattern. You can adjust the spray pattern shape by moving the air cap to either the vertical or horizontal position. The horizontal position will spray up and down while the vertical pattern is for spraying side to side. The direction of the air cap horns will tell you which pattern you are spraying in. The red spray width lever will also help you select between a narrow pattern or a wider pattern. The detail finish nozzle also features 3 adjustable settings: horizontal, vertical or round. Use the round setting for intricate detail work or in narrow spaces. Again, if you have any trouble with the settings, Wagner offers an extensive Power and Materials Guide in your Owner’s Manual. Cleanup is going to go just as fast as when you were setting it up. First, you need to ensure that you’ve unplugged the sprayer before you start. Then, disconnect the spray gun from the handle by using the button below the trigger. Unscrew the container and return any remaining paint back to the can before washing. Rinse the cup completely first with some water until it is cleaned out. Then, use warm, soapy water in the cup when you used latex materials but be sure you are using mineral spirits in the cup for oil-based materials. Attach your nozzle assembly back to the turbine and plug your unit back in. Be sure you spray the cleaning agent into a bucket or other safe area. Next, you’ll want to remove the adjustment ring from the connecting nut. Loosen the nut and a few other internal parts as per the manual and clean with the same solution. When you reassemble, you’ll want to lubricate your o-ring on the back of the front nozzle assembly. If you want further direction on how to clean your unit, be sure you reference the cleaning section of the Owner’s Manual. When you have a painting project to take on and you would like to avoid the time-consuming rollers or brushes, this Wagner Flexio 590 might be the model for you. It is simple to use, quick to finish projects and easy to clean up when done.